CNN's Kelly Murray: I just want to be upfront. I hate tomatoes; I hate raw tomatoes. Harry Klee: I don’t blame you. I don’t (like them) either! CNN: I like cooked ones though. Klee: Yeah, I’m pretty sick of tomatoes myself after sampling many thousands of them. I’m not a big fan of raw tomatoes either. Although I eat massive quantities of them cooked. CNN: Tell me about what exactly your lab does. How do you study the flavor of tomatoes? Klee: Over the last five years or so, we’ve probably grown over 300 different kinds of heirloom tomatoes. We take those tomatoes, and we grind them up to see what’s in them, and then we give samples of each of those to consumers, and we ask them how much they like them. We measure how much sugar is in there, how much acid is there, and we measure the volatile chemicals with a machine called a gas chromatograph. And you can use simple, statistical models to basically extract out a recipe for what is a good tomato. CNN: How would a fruit like the banana differ from the tomato? Klee: So that’s a really good question. Bananas tend to have very few chemicals that contribute to their aroma. There’s one chemical I can give you that if you smell you’ll say, "Oh, it’s a banana." But when you look at a tomato, there’s no single compound that you could smell and say, "Oh, that’s a tomato." We estimate a tomato probably has 30 different volatile chemicals that all contribute to its unique smell and taste. So that is the main reason that working on the flavor of a tomato is so challenging because we can’t just go in and manipulate a couple of chemicals and make the tomato taste better. It’s really kind of a palette; it’s almost like a painting in your mouth of many different colors that, altogether, contribute to making a tomato taste like a tomato. CNN: Is there another food to which you could compare the complex palette of a tomato? Klee: Wine is probably the best comparison. And again coming back to how important smell is, I always tell people, the best way to really appreciate a wine is to hold your nose. If you hold your nose, you block the ability of those volatile chemicals to get to their receptors, and if you swirl a glass of wine around in your mouth while you’re holding your nose tightly, you get almost no perception. And then, just as you’re ready to swallow, if you release your nose, you’ll get this incredible release of the volatile chemicals that will just give you this really amazing, instantaneous taste that is the wine. And it turns out that actually many of the volatile chemicals that contribute to the nose of wine are the very same chemicals that contribute to the flavor of tomato. A wine aroma is probably 20 or 30 different chemicals that all are mixing together to give the wine its complex taste - the same exact phenomenon with the tomato. CNN: Do most people agree upon what is a good tomato? Klee: I think everyone would agree on a very good tomato, but I don’t think people will agree on what their favorite tomato is. Tomato flavor, very simply, is three different kinds of compounds that are in the fruit: sugars, acids and volatiles. The sweeter the tomato is, generally the more people like it. You have to have acid to balance that sugar, so some people like a tomato that’s a little tarter than others. And then we get to the real complexity of the tomato, which is the volatile chemicals. Volatiles is just a fancy name for chemicals that you smell. We’re going to ignore, for now, the texture and the visual appearance, as both things can influence how something tastes. Basically you have two different sensory systems that contribute the most flavor. Taste, which is the receptors on your tongue, where you get sweet, sour, salty and bitter. And smell is where you get all the flavor in my opinion. If you’ve ever had a cold, and you can’t taste anything, the cold is really blocking just the smell. CNN: Which is people’s favorite tomato, based on your research? Klee: It’s very clear that people like the heirloom tomatoes. We take a lot of questions when we recruit our consumers, and basically you can divide them out into the foodies and the non-foodies. There are people who live to eat and there are people who eat to live. And you find that they like slightly different tomatoes. Your basic non-foodie really likes sweet. When we look at the foodies, we find that they like a much more complex tomato with more volatile composition. Overall, a lot of the top ones are cherry tomatoes or fairly small tomatoes. Also, everybody who tastes Brandywine pretty much likes it. I think your average consumer is going to like a smaller tomato because it’s going to have more sugar in it. CNN: Among your basic, commercial tomatoes in the grocery store, how, in your expert opinion, would people pick out a good-tasting tomato? Klee: The problem with the tomatoes is they all look good. Also, many commercial tomatoes have been refrigerated. And the wholesalers refrigerate them, and then the supermarkets refrigerate them, which ruins the flavor. CNN: So would you go to the farmers market to buy tomatoes? Klee: Yeah, I would. But the problem is you can only get them in season. There are some varieties that sell for more on the supermarket shelves that have been picked when they’re ripe, and have in theory, not been refrigerated. A really good one is called Campari. Most supermarket chains carry them. They’re going to cost you twice as much as the typical bulk bin tomato, but it’s a very good product. CNN: How about buying tomatoes ‘on the vine.’ Does that really influence the flavor of a tomato? Klee: So the problem here is when you’re picking those tomatoes on the vine, you pick them up and you smell them and you do smell something. You’re actually smelling the vine and not the tomato itself, so it’s really a marketing gimmick. The good thing about those tomatoes that are picked on the vine is that generally they are picked when they’re ripe. CNN: So a lot of the volatiles must develop very late in the ripening process, while the tomato’s still on the vine? Klee: Yes, they do. Most of the important volatiles are synthesized by the fruit basically after it’s started to change color and before it is fully red. And so, basically, if you pick that tomato early when it’s still green, you’re disrupting the natural ripening process. It occurs, but it doesn’t occur quite the same way as when it’s attached to the plant. CNN: People talk about heirloom tomatoes being closer to the “original” tomato. How is the heirloom tomato different from what we consider the modern, commercial American tomato? Klee: There is no real definition of an heirloom tomato. Most people would classify heirlooms as being very old varieties. I would probably draw the line at maybe World War II. Most people would say heirlooms are what we call open-pollinated - that is, when you can save the seed. It breeds true. Virtually all of the modern varieties are hybrids, so that means when you get seeds out of the fruit, they’re not going to breed true, they’re going to be different. Generally heirloom varieties are really hard to grow. You don’t get a lot of fruit, and sometimes the fruits have really short shelf lives. They crack easily and they’re really soft. Modern varieties are far, far superior in terms of yield, disease resistance and shelf life. But the big thing - at the heart of the difference - is heirlooms frequently do taste very good, and modern varieties frequently don’t taste very good. CNN: I’d argue that the texture is not even that good. On a fast-food hamburger, you get a tomato, and it’s just soggy and flavorless and not even a pretty color. Klee: You’re absolutely correct. And part of the texture is also related to the modern breeding for long shelf life and shipability. People are passionate about tomatoes, but a large majority of those people are really disappointed in what they can buy at the supermarket, and so they don’t buy them. But if I can make a tomato that really tastes like an heirloom tomato, that’s really good, would you really like it more? And if you really liked it more, would you eat more of it? I think if we’re successful in understanding how to improve flavor, to bring back flavor to where it was 100 years ago, but maintain that in a package that the growers can still grow and make money at, you’ll make healthier dietary choices. What if we can make a peach that you can bite into that will taste just like a peach is supposed to taste like, like you just picked it off the tree, warm from the sun. Would you choose to eat that instead of a piece of cake? By and large, I think the answer to that is yes. 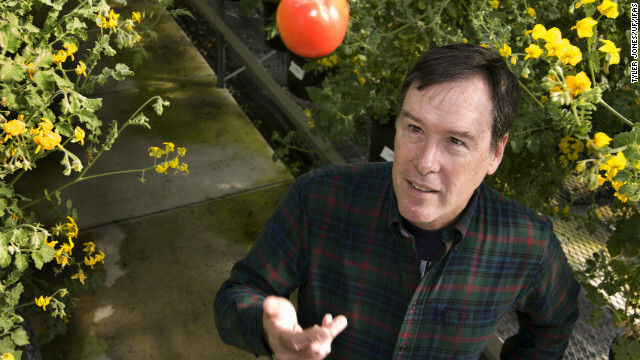 Can someone who hates tomatoes ever create a genetically enhanced tomato that is safe? And tastes good? I have doubts. Do you? and now you have the guts to explain to us why they don't have any taste or smell at all. Come to the Dallas Farmers' Market at the peak of Texas tomato season, say mid-July, and get a tomato at Lemley's stand. I hated raw tomatoes until I discovered these. They are magical. I long for the first Lemley's tomato of the summer. I buy them by the dozens and eat them every day, raw, sliced with salt. They are a sublime experience and turned this true tomato hater into a to tomato connisseur. In Holland there is a tomato called "Tasty Tom" and it's the best tasting tomato ever. No matter what time of the year it taste like a ripe summer tomato. Should come up on a googlr check. They grow them in different warmer climates year round. Theycost more but worth the cost. Harry, we know your work effort and the time you and your staff have spent on this project. We believe in what you are doing!!! Gainesville is our hometown...been in CO for seven years and there isn't a good tomato to be found in the stores here. No flavor at all. Store bought tomatoes are usually grown hydroponically too. They are basically being grown in a chemical soup. They grow fast, look good, make quick profit...but compared to the old fashioned way of growing them in natural, fertile soil, they don't compare flavorwise or nutritionwise. N-P-K levels aren't the only requirements that plants need to grow healthy. Good healthy soil is a complex living organism with a huge population of microflora and micronutrients that really make the difference. The best tomato is always the ones the birds get the day before you'd planned to pick it. You definitely lost my vote after the line 'manipulate a couple of chemicals'. What is WRONG with people now? As others have said, a locally grown and above all in season vegetable or fruit is the biggest component in terms of taste. PIck it green and fly it in from Chile and you get what you deserve; a cardboard cut out of food instead of the real thing! Another thing which impacts the flavor is the soil. Need the right pH and minerals, otherwise even a homegrown tomato will be bland. You don't like tomatoes b/c you've never eaten one grown from your own backyard. Homegrown tomatoes > Farmer's market tomatoes > Store bought tomatoes > fast food tomatoes. If your basic idea of eating a tomato is a slice on a fast food hamburger, then it's no wonder you hate them. Try getting someone to give you a single, ripe tomato; slice it and add a little salt. If you still hate tomatoes, then OK, but at least you'll have an idea of what they're suppose to taste like. AMEN! I've been all over and nothing tops a Jersey tomato! I prefer Martha McCallum...She's gorgeous!! Bring back heirloom tomatoes and other vegetables we eat. Get rid of hybrids. They are destroying the gene pool for our food. Bigger or prettier is not what it is about. The big companies want it where you can't get seeds to grow your own food unless you buy their hybrids. I think you are referring to GMOs, which have been injected with genes from other species and all kinds of chemicals (such as ROUNDUP READY SOYBEANS) that allow them to be sprayed with Monsanto's herbicides and pesticides. Monsanto and their ilk are attempting to control the world's seed supply and nearly 80% of our heirlooms have been damaged with pollen from their seeds, and they have successfully sued farmers whose crops have been contaminated!! GMOs are made in a lab, hybrids are simply plants that have been cross pollinated by another variety of their own species, either naturally in nature or specifically by a gardener or farmer. Join the fight in your state to first get GMOs labelled, then lets ban them altogether in this country like many others have. You can stop reading when someone tells you to taste while holding your nose to get the best flavor. The irony here is that if you kept reading, you would have seen the explanation for why the interviewee suggested this. Way to fail. Amen for those home-grown Beefstakes! The best store-bought tomoto I have found is the Campari. Not too sweet or tart and a good size for a sandwich or salad. This story is ridiculous. Everyone knows there's no tomato that compares to a home-grown tomato. The ones that are grown in the sticky southern humidity in a down home southerner's backyard! Tomatoes love dry weather best, that is why the Italian ones are the best. The best tomatoes ever are the ones I cultivate at home, I used nothing but Compost and chicken manure, and I have been praised on the color and flavor of my tomatoes.